There are times when epoxy mounting and polishing to cross-section a sample in order to expose and study a region of interest is not practical. For example, a failure site on a semiconductor device in a ceramic package is difficult to cross section due to the differences in the material hardness and small device features. Additionally, imaging and analysis in the SEM or Scanning Auger may not clearly show extremely small details or thin layers of a sample. In such situations TEM imaging can provide significantly better imaging resolution and analysis of smaller features, leading to a better understanding of the nature of materials, failures and solutions to problems. And preparation techniques such as FIB milling can be used to prepare samples for TEM with greater control and reproducability than other mechanical methods. In the TEM, a thin (< 100 nm) sample is placed in the path of the incident high energy (typically between 50–200 keV) electron beam, which passes through the sample. The image that is collected below the sample is analagous to a diagnostic X-ray in that it is a “shadow” image showing gray scale based upon the electron stopping power of the materials the beam has penetrated. Areas of higher atomic density appear darker in the image than areas where the beam passes through easily. Typically, materials composed of heavier elements appear darker in TEM images. The distribution of particles, phases, or materials in a section can be imaged in this way where even the atomic lattice structure can be imaged, at magnifications of up to 1,5000,000x. Since the electron beam has passed through the sample before any significant secondary excitation and “spot blooming” such as occurs in the SEM, point analyses can be performed by EDS to determine the elemental composition of various features down to a few nanometers in diameter – compared to a micron or more in the SEM. 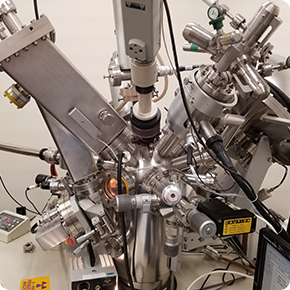 In a TEM that is equipped to scan the electron beam (Scanning Transmission Electron Microscopy or STEM) similar to the SEM, additional EDS analyses such as elemental mapping and line profile data can be obtained to show the distribution of multiple elements found in the sample. Additionally, crystalline and microcrystalline materials can be examined to generate electron diffraction patterns. In this mode, the atoms of the crystal elastically scatter the electron beam resulting in an interference pattern image (Kikuchi pattern) or diffraction pattern, depending on the crystalline or microcrystalline nature of the sample. The diffraction pattern can help a materials scientist get structural information such as crystalline symmetry, unit cell parameters and space group information. providing information about the lattice spacing. Metallurgists often use diffraction patterns to study phase separation, precipitation and other microstructural information.